When I was a kid, I hated pork chops. Actually I think everyone in my family did, because we almost never had them at home. To me they were a dry-as-a-bone, flavorless meat that needed to be chewed for an eternity just to be swallowed. I clearly remember being at a friend’s house for dinner and feeling disappointed at hearing that the dinner included pork chops. As an adult I started to experiment a bit with them, mostly because I am not the hugest fan of chicken. The truth is, pork is a fantastic alternative to chicken in so many ways. It can be very lean and it has a very mild flavor like chicken, so it is very versatile and not expensive. Pork can be a nice change if you make chicken all the time. You can easily take almost any chicken recipe, substitute pork chops or tenderloin and you’ve got a whole new, yet familiar and comforting dish. About 6 years ago I was watching a cooking show where the chef showed how to brine pork chops. Until then, I thought brine was just for pickles. It had never occurred to me that you could do this with other things! I tried her recipe and it was fantastic. The chops, no matter how thick or thin, came out moist and juicy. Not only that, but the flavor of whatever I added to the brine would come out in the meat. WOW! This was a complete revelation that changed my cooking forever. Brine is actually just simple chemistry. Meats (or vegetables) already contain saltwater. When you immerse them into a liquid with a higher content of salt, the brine is absorbed along with any other flavors in it. This basically seals in extra moisture and flavor so that when the meat is cooked it stays inside. Most brines are LOADED with salt (and I still say kosher!) and the recipe I first tried had a ton. I noticed that in smaller batches, the salt can sometimes stick to a piece of meat and you can get a couple of bites that taste like a salt lick – not too appetizing. So I did some brainstorming and I think I found a great way to avoid this. You can use this brine for anything. As usual, I will add suggestions on how to change it for whatever you are making. This is so easy you won’t believe it! You can use bone-in or out and you can go as thick or thin as you like with the chops. I would keep the brine-time shorter if they are really thin. You can also use whole pork tenderloin and cook it the same way as the chops. This is my big trick. Soy sauce, baby! It is the perfect sub for salt in this recipe. I usually buy low-sodium soy sauce, but as long as you buy a quality one you’ll be fine. You can use light, dark, whatever. The reason I got those salty bites of meat in the past was because when I added a ton of salt, some didn’t dissolve. We don’t have that problem now since soy sauce is liquid. It automatically will make a solution with whatever other liquid we add. Food should never taste like the salt that is added to it. Salt’s purpose is to enhance the flavors of the food. Usually brines’ main liquid ingredient is water. But I use apple cider (not the carbonated kind – use natural hard pressed cider that is made only of apples). Apples and pork are old friends. What could be more perfect of a flavor to add? I also add chopped fresh apples sometimes if I have them on hand. If you don’t have apple cider, just use water. You can always use water for brine. I personally like to add rosemary (another good friend of pork), thyme, and parsley, but you can do whatever you like. The herbs will brighten the dish and give the flavor more depth. If you wanted to try a kind of sweet & sour thing you could add juice of an orange and a lemon along with some Agave nectar. Just an idea to change it up! If you want to go traditional on the brine and use salt instead of soy sauce, then just put 1 ½ cups of the cider in a sauce pan with ¾ cup KOSHER salt. I would not use any other salt ever to brine. The too-salty margin is just too great. Heat the solution until the salt is completely dissolved. Either let it cool in the fridge or add some ice cubes. It needs to be room temperature or colder before adding the rest of the ingredients. When I say roughly, I mean roughly. Don’t peel them, even the onion & garlic. Just chop into chunks and you’re done. They are not getting eaten, they are flavoring the meat only. Just make sure the pieces are small enough to get all of them and the meat into the container. Place/pour all ingredients into a large sealable container. Make sure that the chops are completely submerged. Cover and refrigerate for at least 8 hours but up to 3 days. After 8 hours the job will be done, but the longer you leave it the better it gets. However if your chops are thin or you have subbed chicken, I wouldn’t go more than 24 hours for food safety reasons. When ready to cook, remove chops from brine. Using paper towels, gently pat all sides of meat dry. Let rest (not in the fridge) for 15 minutes-2 hours. We need the surface of our meat to be dry so it will sear. This will seal in the flavor and juices. If the meat is wet on the outside it won’t get that golden brown look, making it much less appetizing (we really do eat with our eyes first). When cooking any meat, you want to take the chill off before starting. Placing cold meat on a heated surface will make it tougher, and whatever cooking method you are using will be less effective. The rule of thumb with cooking (at home or in a restaurant) is that meat can be left out for up to 2 hours maximum, but check the temp and don’t push it. As soon as it’s room temp, go for it. Preheat oven to 425 degrees. Heat a large oven-safe skillet on high until it just starts to smoke. I really love to use my cast iron skillet for this. If you have a rubber handle on your skillet, try covering it with foil to protect it in the oven or just transfer the meat to a baking sheet when finishing it off in the oven. Don’t worry about the smoke, it’s just the pan’s way of telling you it’s ready for something to go in it. You want this pan literally smoking hot when the meat goes in. It won’t sear if the pan isn’t hot enough. If your pan isn’t non-stick, then drizzle a tad of olive or canola oil in real quick at the end. Sear the chops for a little less than a minute on each side. Then place the skillet into the oven and let bake for 7 – 12 minutes depending on thickness of the meat. Once you place them in the pan and you hear that beautiful sizzle, keep your hands to yourself. Don’t move them or mess with them; just wait about 30 to 45 seconds then check. If it is golden brown, then flip. If it’s not golden yet give it another 10 – 20 seconds or so. We’re not cooking the meat through at this point. We don’t care that it’s still raw on the inside. All we are doing is sealing the flavor and juices inside and giving the outside that beautiful crusty, golden caramelization. The finishing in the oven is what will cook the meat through. This method (searing then baking) is very common in restaurants. How do you think the steakhouse cooks your steak so perfectly? This is how. 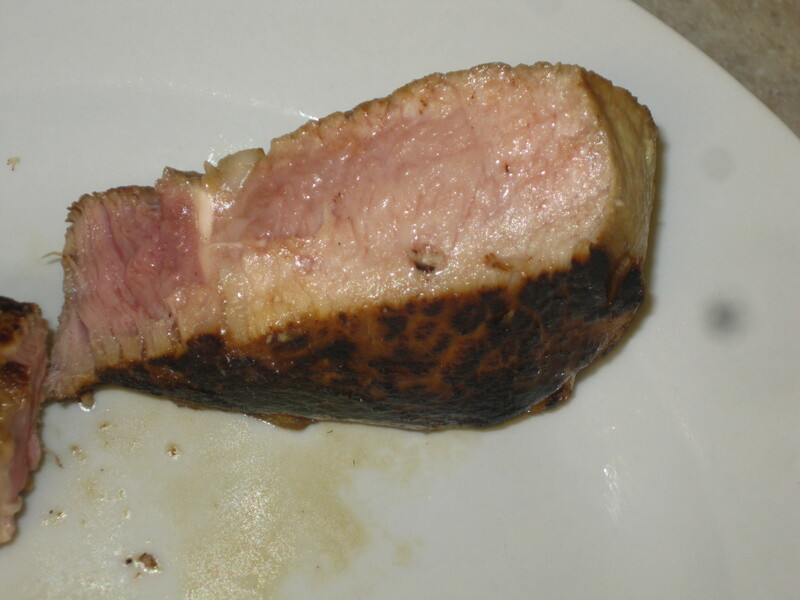 Now although most people treat it like chicken, pork is perfectly safe (and incredibly delicious) served medium-rare. If your chops are thin, I would stick with 5 – 7 minutes in the oven. If they are thick, go 7-10 minutes depending on how you want it served. I would go the full 12-15 minutes with pork tenderloin. 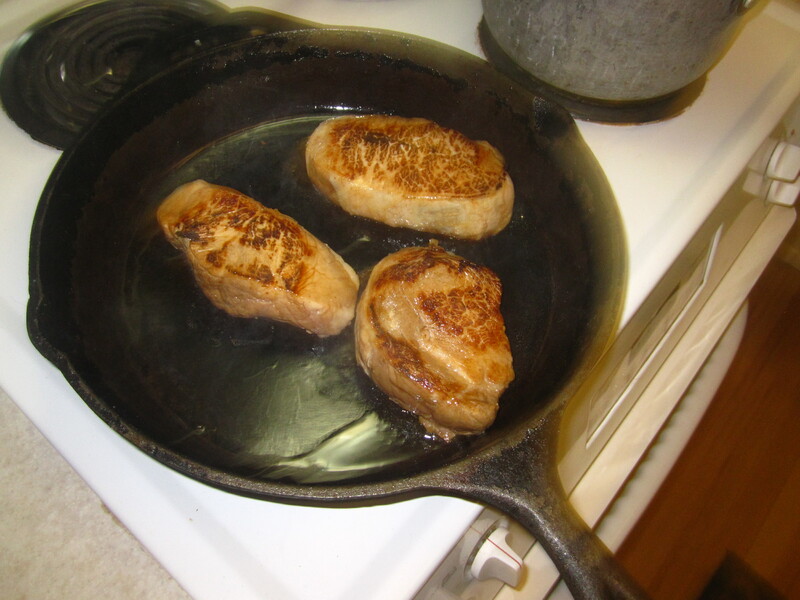 Cook chops on grill over a medium flame, covered, for about 8 to 10 minutes each side. Basically we are searing and cooking through at the same time with a grill. For tenderloin I would go about 5 minutes on each side all the way around. Once meat is cooked, place chops on a plate and tent with foil. Let rest for 10 minutes. When cooking ANY meat, resting is crucial. If you cut into your meat immediately after removing from heat, all those juices will run back out. Letting it rest does two very important things: it helps the juices re-distribute throughout, making every bite juicy, AAAAND it finishes off the cooking process. Although when it is taken off the grill or out of the oven the meat is technically “ready”, it will continue to cook while it rests, bringing it to the perfect temperature. 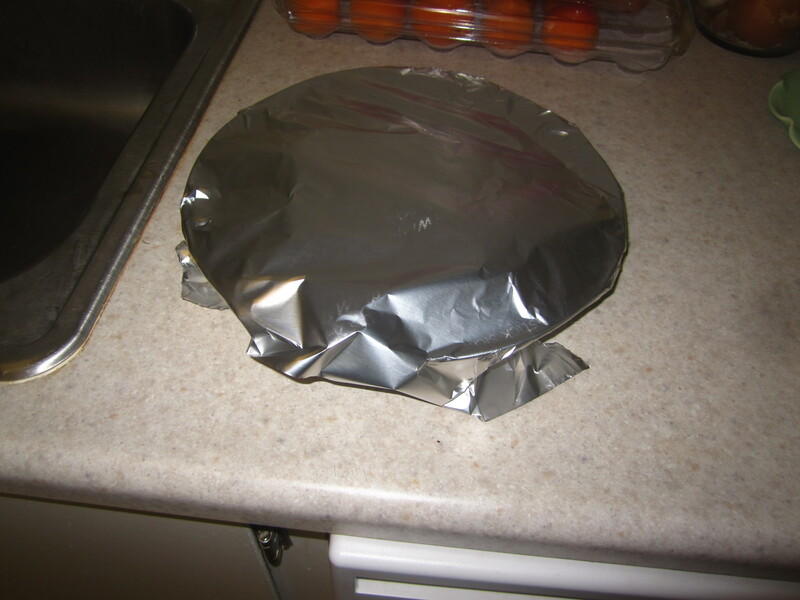 The foil ensures this process takes place and also keeps the meat warm for that 10 minute waiting period. Seriously, guys, this makes ALL the difference! There is one more thing I wanted to specify. 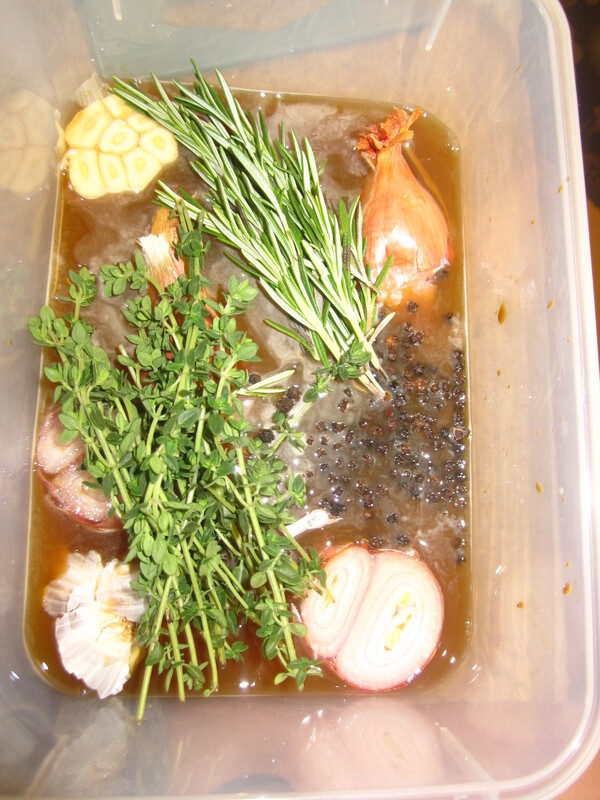 When you brine anything, be it turkey, chicken, or pork, the brining process really does get absorbed into the meat. Not only does the meat taste different (BETTER!) but it will look slightly different on the inside. Your meat will be pinker (even when cooked well done) than it would if you didn’t brine. This can freak people out the first time. All you need to do to make sure your meat os fully-cooked is to watch when you cut into it. If the juices run clear, it is safe. This doesn’t mean there is no color to them, but that there is no cloudiness. If you don’t feel confident enough to use the clear juice method, then buy a food thermometer (probably $3 at any grocery store) and AFTER letting it rest make sure the temp is 145 or higher. You want the pointy tip of the thermometer to be in the center of the meat. An internal temperature of 145 degrees is the international pork standard for safe. Thank you for reading my recipe! I have also added a printable version of this recipe without all my witty repartee (ha-ha!). I hope you enjoyed it enough to try it! If you have questions or comments feel free to email me at bradymunchblog@yahoo.com! For more of my recipes and delightful commentary, please check out my blog BradyMunch on Word Press! !